The boy dropped his head for a moment. and held it up to the farmer. And with that he let out a whistle. the little boy noticed something else stirring inside the doghouse. and also have a small child, please take this as a warning. 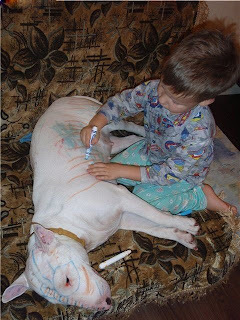 Don't leave your dog with the child unattended under any circumstances. One very recent success story keeps taking wonderful plot twists—after being rescued this month from a Tennessee puppy mill, Boston terrier mix Yoder found love with first-time adopter Cindy Stout. “Thank goodness Yoder was transferred to the Charleston Animal Society here in South Carolina. It was love at first sight. He looked up at me with his innocent eyes and barked something akin to, ‘Pick me, pick me!’” recalls Cindy. I was on the NEBTR website and checked out Sparky's "adoption" site and for the first time saw his original pics when he was at the shelter. he looks so scared it nearbreaks my heart, BUT he is safely at home with me now. We would very much like to be on your successful adoption site. 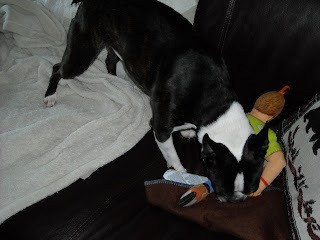 I think it is important that people see that a Boston with a strong personality as sparky can have a successful relationship and life with a new owner. 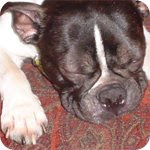 Sparky has and is going through extensive training & is a sweet, loving & obedient dog. contrary to his writeup, (and with a lot of hard work on both our parts) he is very social with dogs, cats, kids & people, loving and loyal. 99% of the time he is obedient; but Sparky being Sparky with his very strong personality, he does continue to test me the other 1% of the time as he would just love to be pack leader, but he submits to me without a problem any more. I don't think a novice with dogs would have been able to handle him, but after years of owning Bostons (& I've had otherBbostons with strong personalities) I know how to handle him and have not hesitated to get help from a dog trainer also. I expect Sparky and me to have a long and loving relationship. After only two months, he is still not sure this is "it" for him, but time will show him this is home for good. He loves to hang out in the sun with me, ride in the car on errands (dunkin donuts drive thru gives him a munchkin), and he loves to run in the dog park with his "buddies" twice a week. He dances on his hind legs, gives me a bark when he needs to go out, heels off leash and comes on command outdoors; he responds to all hand signals now without voice. I can't thank you all enough for matching Sparky with me; I am looking forward to many years of loving companionship with Sparky. I would also love to do any volunteer work; unfortunately I can only have one dog where I live, but am available for other avenues. I have attached a few pictures that I don't think I have sent to you. I feel so blessed to have him in my life. 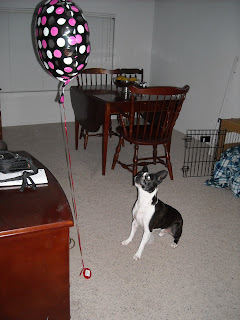 He has filled a large void in my heart and home after losing my two elderly Bostons the fall of 2008.